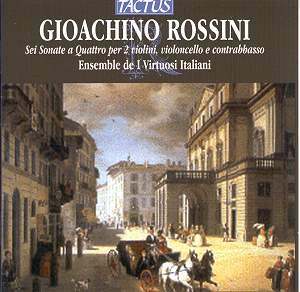 These six sonatas were composed at Ravenna by the twelve-year-old Rossini in three days; this was before he had had any lessons on composition. They had were discovered by Alfredo Casella at the Library of Congress in Washington and were published complete in 1954. These works are amazingly mature and quite delightful to listen to. The absence of the viola and the inclusion of the double-bass give a strangely open effect, which is almost unique in this genre. The form is more akin to the Italian "mini-concertos" than the German style of string quartet. The two violin parts are given equal prominence; likewise the two bass instruments are almost completely independent of each other. The maturity and melodic power of these pieces are outstanding, considering the age of the composer. The sonatas became widely known to the public due to a spectacular early recording by the Academy of St Martin-in-the Fields conducted by Neville Marriner. The popularity of that disc was a major boost to the reputation of ASMIF. The ensemble work of this version is stunning and it still sounds well. It should be noted that a part for two violas was included in this version. A number of string ensembles produced similar versions subsequently. This current version is the first recording that I am aware of which plays the sonatas as written: for four instruments only. Before playing this recording I felt sure that the sonatas would feel thin in comparison to the virtuoso ensemble versions with which I was familiar. This however was not the case and I was totally won over by the excellence of the playing by this Italian group. In many movements the tempo is faster than those of the multi-string versions but sounds very natural. The overall impression is of four very skilled musicians playing for their own pleasure. The recording and presentation is also very good.